I have to admit, I am never good with numbers. 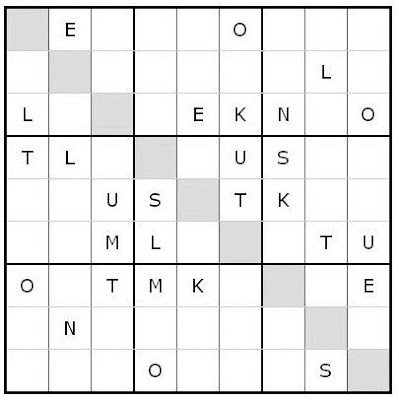 A couple of years ago, my sister introduced me to the Japanese number puzzle called Sudoku. I tried to play it but could only solve the easiest puzzles, giving up on the more difficult puzzles. This morning, I discovered something called Wordoku. This is similar to Sudoku, except that we use letters to form words, unlike Sudoku which does not make sense to me at all. Hehe! This entry was posted in Games, Printables and tagged free puzzles, free Wordoku, puzzles, Sudoku, Wordoku, Wordoku puzzles on August 26, 2008 by Cyberpartygal.